This one is about the relationship and personal life from the Jamaican singer and songwriter Bob Marley. A simple and very meaningful quote that everybody can understand. However, I think a better understanding will help you live your life with more positive outlook. Why I found this one is important is just because every relationship these days are going through a serious of struggles. If we love someone, we naturally expect a little care from them. That's why people say never expect anything from anyone. Besides, I am asking you what's the point if we expect anything from the one we love. If we really love someone we have to love them without expectations. Is it possible? 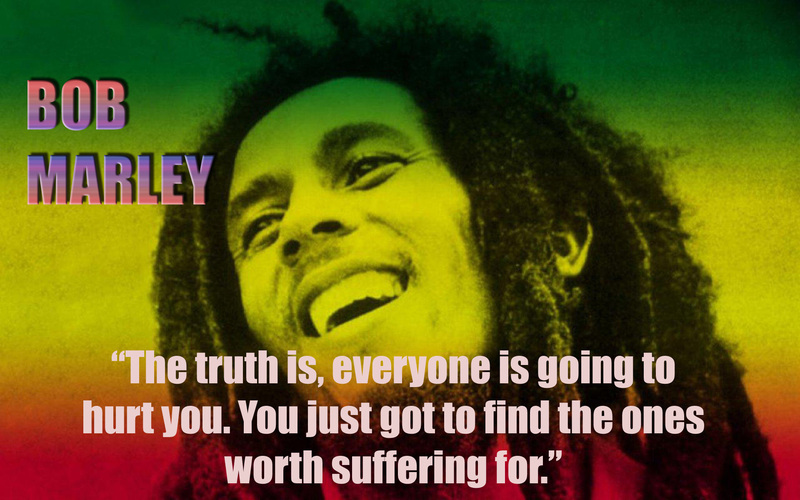 Well, Bob Marley giving us an answer. You got it. Ok, here we go once again to what he said. Have noticed, He is saying us to expect that the person who you love is going to hurt you for sure because nobody can make as happy always. So if we are willing to accept our beloved one's character with their negative things, we cannot get hurt that much. Nobody is perfect in this world. Everyone have positive and negative qualities. At sometimes we don't even know that others are suffering because of us. So don't get hurt yourself from others easily. You need to keep in mind that you are not thinking like a single-minded person. Always show empathy to others and try to understand their feelings too. If somebody around you is hurting you remember that they have their own reason and in most cases they never wanted it to happen like that. 1) "It is not the strongest of the species that survive, nor the most intelligent, but the one most responsive to change." 2) "Expectation is the root of all heartache"
3)"The Biggest communication problem is we do not listen to understand. We listen to reply"
4)Don’t depend too much on anyone in this world because even your own shadow leaves you when you are in darkness.